This Fixman Screwdriver and 28 Bits Set is made to get the job done. Designed with a grip handle and constructed of heavy duty metal. Includes: 28 CR-V bits. The DEWALT MAXFIT line of screwdrivers does not disappoint. These products include a Magnetic Screw Lock collar, allowing you to start a screw more easily and eliminate wobble and dropped screws. The telescoping multi-bit screwdriver has a telescoping bar that provides the right amount of length when working in hard to reach spaces. The efficient 6-way multi-bit screwdriver allows you to quickly change and store bits. For any task requiring a precision screwdriver, forget about dragging out your toolbox or wasting time looking for misplaced tools. 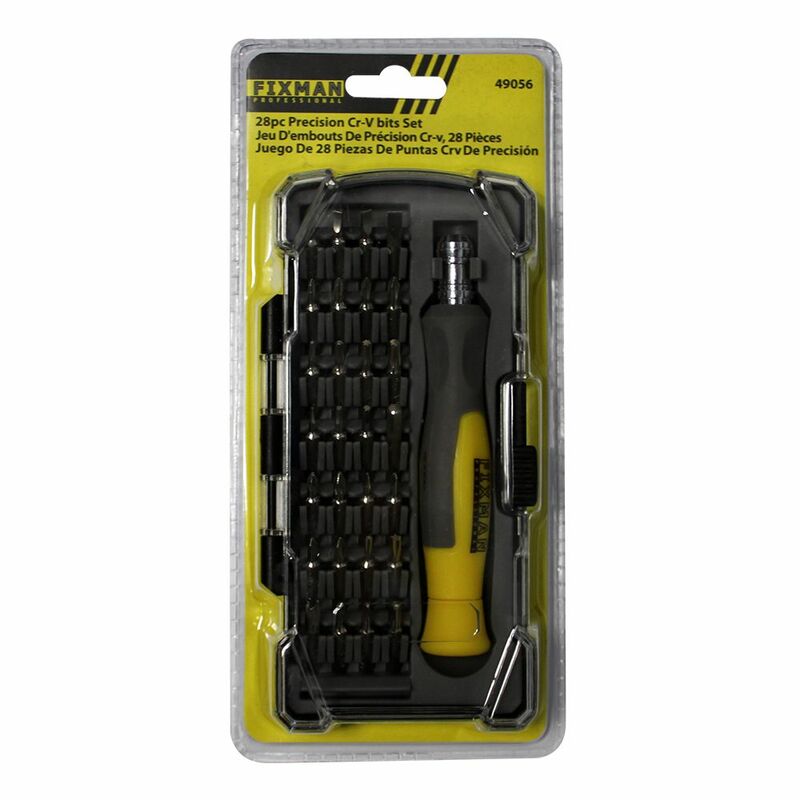 This compact multi-bit screwdriver stashes easily in your kitchen drawer for fast retrieval when needed. With double-ended bits that can be stored in the handle and are easy to swap out, and a shaft that extends from 5 inches to 7-1/4 inches for hard-to-reach places, this multi-purpose precision screwdriver includes a variety of 12 Phillips, slotted, torx and square bits. This classic 17-piece screwdriver set contains virtually every type of screwdriver needed for practically any job: from installing shelves in your home office to tightening a wobbly table leg to replacing a loose clamp on your car's radiator, these quality rust-resistant screwdrivers with their Golden Grip handle make short work of any job. Screwdriver and 28 Bits Set This Fixman Screwdriver and 28 Bits Set is made to get the job done. Designed with a grip handle and constructed of heavy duty metal. Includes: 28 CR-V bits.